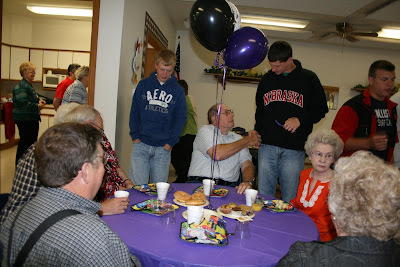 After breakfast the graduating seniors enjoyed visiting with their grandparents. 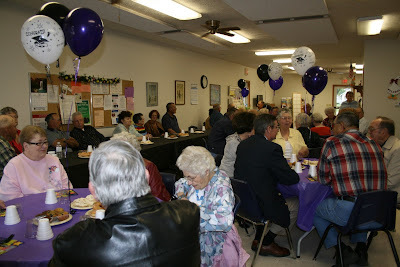 The Exeter Senior Center was full of graduating seniors and their grandparents. It's a little early but these seniors are ready to dig into some breakfast. The Exeter Senior Center once again hosted their Senior to Senior breakfast. This gives the graduating seniors an opportunity to celebrate their graduation with their grandparents and great-grandparents. Nine years ago the Exeter Senior Center started the program based on the idea of then advisory board member Elva McBride. McBride recalled a similar program in her hometown of Mc Cook. At the program, Fillmore County Senior Services Advisor Brenda Motis stated, "This has become something the grandparents look forward to, a special time for them to spend with their grandkids." The center had rolls, muffins and donuts on the table for the guests and served everyone a breakfast casserole. Coffee and juice was poured by Senior Center volunteers. The color themes were purple and black as chosen by the graduating class of 19, all of whom were present. After the meal was served Motis took the opportunity to talk to the group. She reminded the seniors that "No matter what, always remember you'll always have a link to the Exeter and Milligan communities and family and friends and neighbors like us who are thinking of you and supporting you all the way. From all of us at the Exeter Senior Center, the best of luck to each of you." When they finished their meal, the graduating seniors were asked to introduce themselves, tell the group about their future plans and introduce their grandparents. 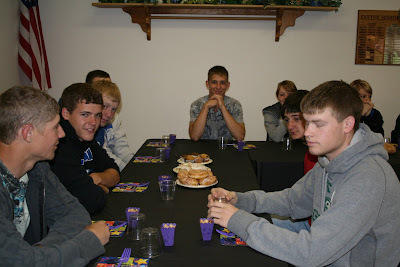 In addition to serving the breakfast the Senior Center also held a drawing for Casey's gift certificates. The female gift went to Ana Androyna and the male gift went to James Strate. They also drew names for all of the balloon bouquets that were used as decorations. The volunteers who made the event possible were Elva McBride, Evelyn Elznic, Evelyn Michl, Doris Hall, Roma Rhodes, Shirley Janes, Elaine Krejci, Marion Geiger, Tess Moor and Darlene Becker.